So right now I’m sitting in my apartment in Nice on the Cote D’Azur looking out on what is possibly the most magnificent sun sets have seen this trip. 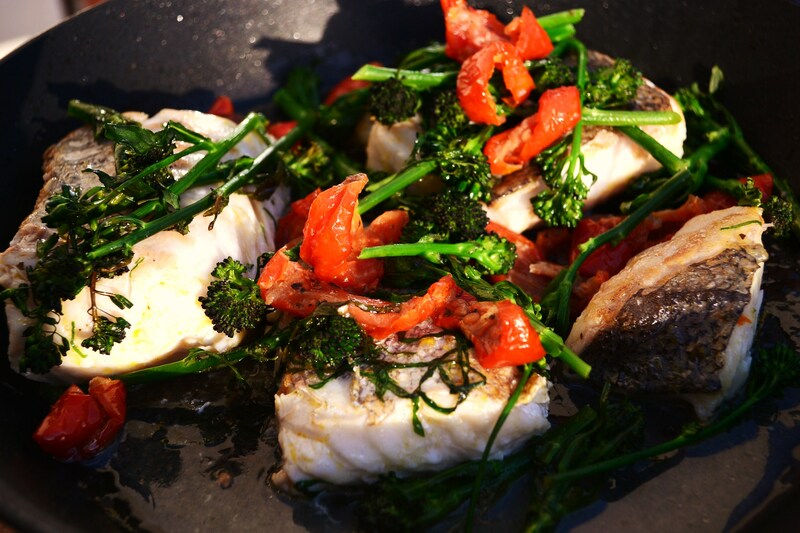 However as I have a little time to kill before wandering out into Nice Old Town in search of more French magic I thought I’d keep my blogging fingers busy and post this little dish I spun up with my own stem broccoli last week before heading Riviera-side. Grab a wide pan and get it on the heat, add a lug of olive oil and the butter and bring up to full heat without browning the butter. Season the hake well all over then add skin side down to the pan and cook for about 2 minutes. Next flip the hake over and remove from the heat, add the wine to the pan along with the broccoli, garlic and tomatoes. Spoon the pan juices all over the broccoli then add the pan to a pre-heated oven at 180c. The Hake should cook perfectly in about 6-8 minutes…. Enough time to also cook the broccoli (Al dente) and warm the tomatoes through. Next Post Toulouse sausage….the right way!